There are currently 116,413 users on this website. I have gone throuh s great length of time searching and searching for branch mint proofs. Not just Morgan's but all of them. I have researched for years and was able to see one in person. 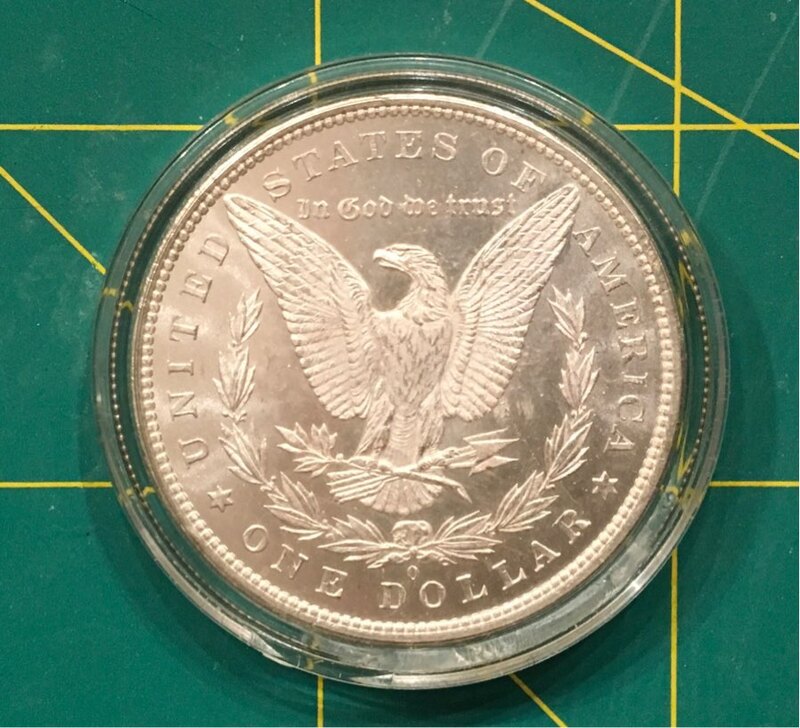 It was an 1883-O. I don't want to bore you guys so I'll get to the point. I've got a lot of experience. I go to shows, am a member of both top tier companies, am a CAC member.. so on and so fourth.. so I'm not just a newbie wondering what they have. Out of the tens of thousands of coins I've owned, I believe these are my top notch prime suspects for the 1883-O b.m.p. 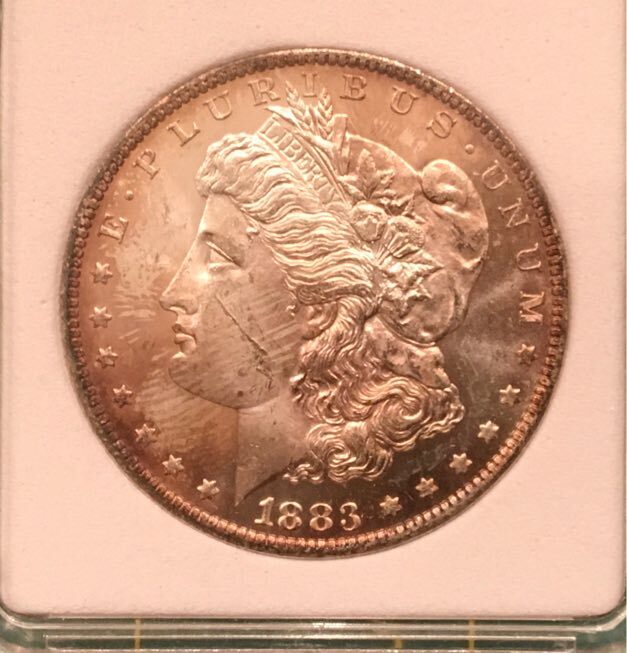 Please check out the Heritage site for the 1883-O Branch Mint Proof pictures they have up there of the one coin they have that's graded from the Eliasberg collection. You can also find one if you google "jack lee and NGC auction" .. okay so without further wasting time.. please let me know your thoughts! to CCF @Chanteezy. My best advice for you is to join VAMworld to get the correct audience. There are a few guys over there that really know 1883-O. Ray Sanchez just completed a die study and is at the top of the list for people you should reach out to. I believe the Eliasberg specimen is a VAM-19 which has a dash 8 and mint mark set slightly left of center. Your first example looks like it fits that criteria. Best of luck.. I don't want to bore you guys so I'll get to the point. I've got a lot of experience. I go to shows, am a member of both top tier companies, am a CAC member.. so on and so fourth.. so I'm not just a newbie wondering what they have. Always good to be reminded that a person's 1st post here doesn't make them a newbie. You sound very qualified and I am sure that if you stick around here, you will be a great asset to this community. An interesting topic. In my opinion, both the coins appear to be business strikes that are semi-prooflike or prooflike. So the camera angle is off and the toning is hiding it in the first one, but the first is as mirrored as it gets. Proof mirrors like deep lakes. Know how a employee looks like a cheap knock off mirror but proofs have that smooth expensive mirror? Yes.. now the tricky thing about New Orleans bmp's is that they couldn't get the mirror quiet down as well as philly. I read in the book written by Wayne Miller ( whom actually emailed me back a few times and It was like talking to a movie star in my mind.. I felt like a giggly school girl) that the 83-O BMP is silvery compared to philly proofs. The man himself also mentioned to me per email that the denticles are not squared all the way around making the species even harder to pin point. To Dave 700x: thank you thank you for the info and yes I've read up on the VAM site plenty and am a member over there. I didn't post there but I read and printed pages and pages from that site as I read it's coming down. Because of it's coming down I figured there weren't as many people posting or looking over there so I took a chance here. It's interesting because Wayne Miller in his books says the 83-o bmp has a scratch above the eagles head. Almost like a cap around the back of the head.. the Elisiaberg has scratches above the eagles head that are long and strange indeed.. the jack lee bmp, well I can't even see a scratch above the eagles head so as far as VAMS go for the 83-o, I just don't know if there is one that flows through every coin minted. To you all that responded, THANK YOU! I appreciate it so much! I'll be back. 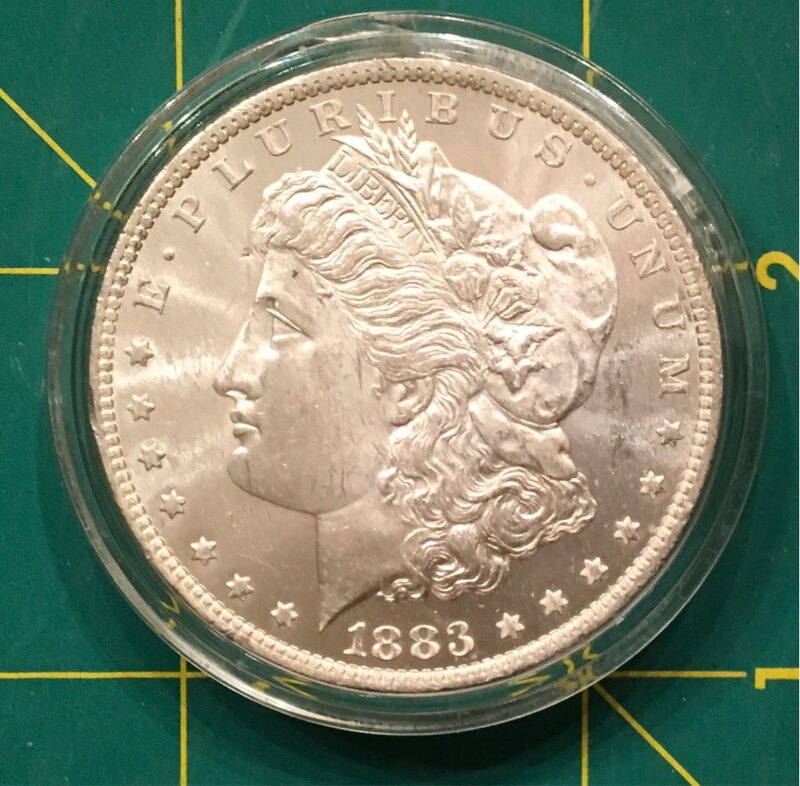 And if you would like a better pic "silver dollar 2017" I'd love to send them because they are truly beautiful Morgan's no matter what they are. Welcome to the Forum Chanteezy. This is a great place to share and learn. 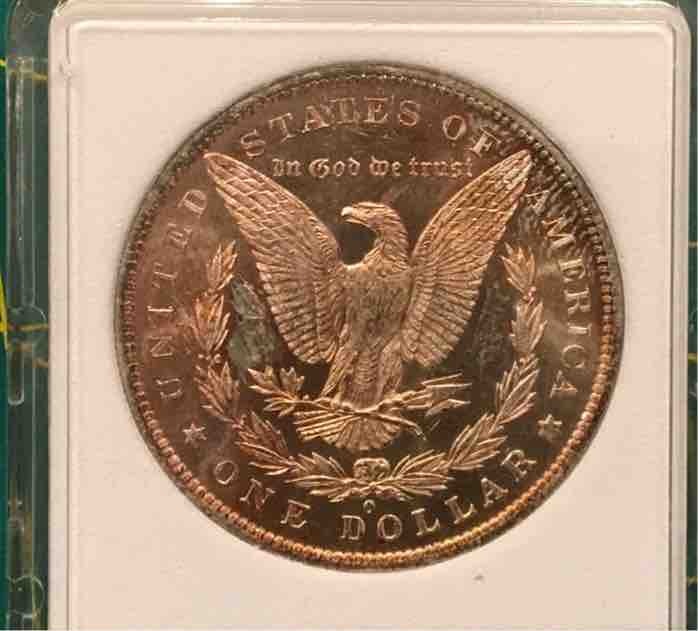 It is the above mentioned toning that makes some of the diagnostics difficult to verify on this coin. However, others are unmistakable and this coin is consistent with the Anita Maxwell 1883-O branch mint proof we sold in our 1995 ANA Sale. In an article published in the October 9, 1995 issue of Coin World was based on the Maxwell coins, the following diagnostics are easily discernable. 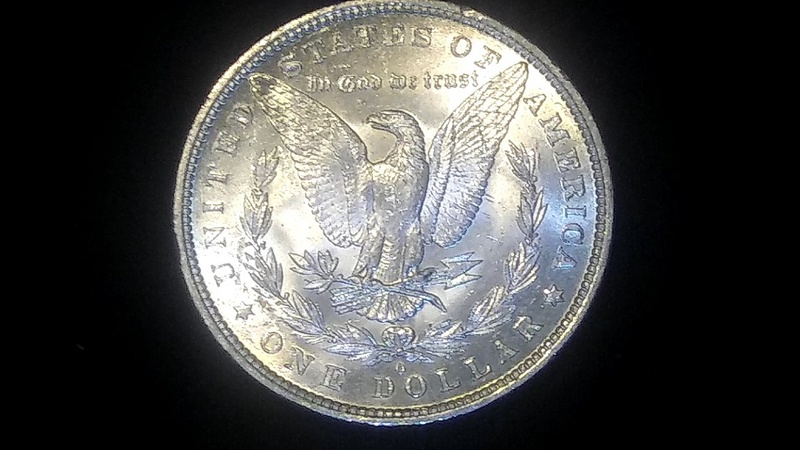 Obverse: There is a short die crack at the lower crease of the neck. Reverse: 1. 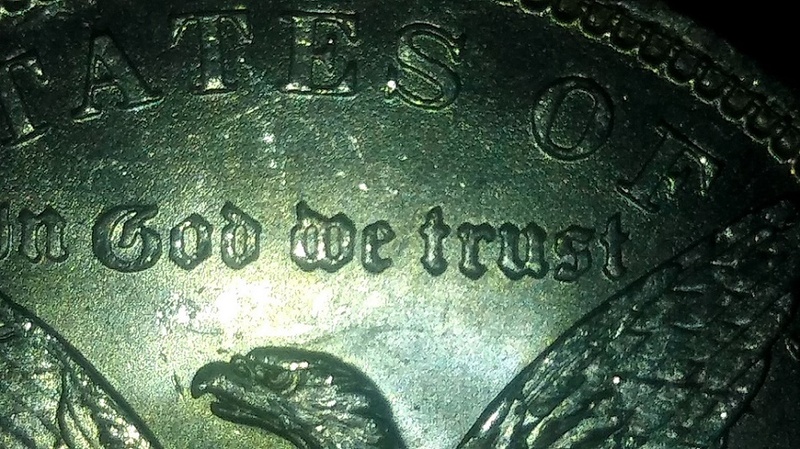 A faint die crack angles up and to the right from the top left of the D in DOLLAR. 2. On the second cluster of leaves on the left side, the bottom two leaves are noticeably thinner from excessive die polishing, the upper leaf on the third cluster is disconnected, as is the rightmost leaf on the fourth cluster. 3. A "notch" of die polish is on the upper right wing feather, close to the wing tip. 4. Complete die polishing between the eagle's head and right (facing) wing. The 1883-O is one of only four issues that Wayne Miller classifies as Type One branch mint proofs, i.e., an authorized and definite issue. This is a rare opportunity to acquire for the Dollar collector. I think this was already answered on CU. 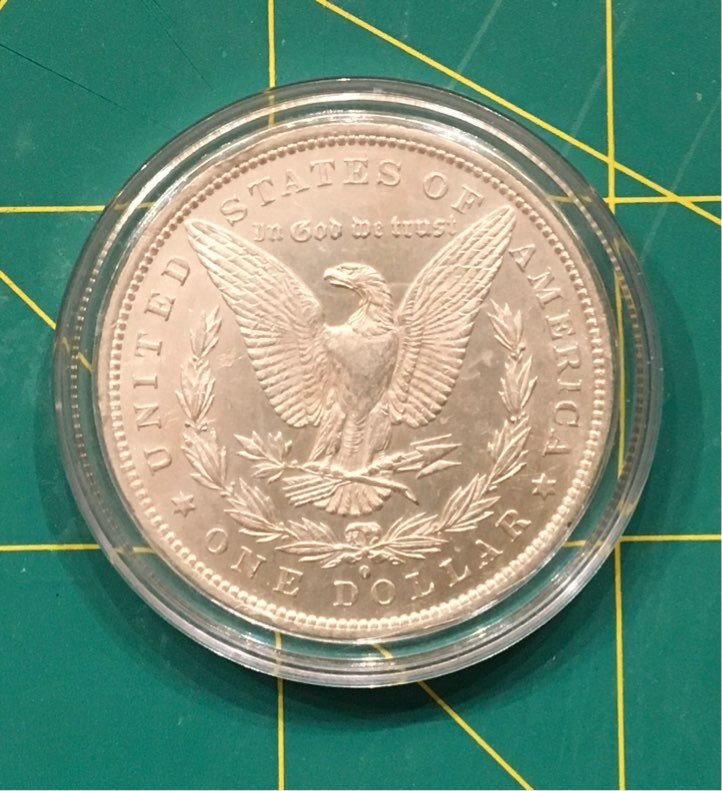 Messydesk is an authority on Morgan dollars and answered your question, your Morgan is not the die pairing that was used for what is considered the branch mint proof. Hardy12: mint mark position on your coin does not match. The 1883-O BMP mint mark should have it slightly left with slight left tilt. Also, biggest telltale I see is the fact that your coin is clashed. If this is a proof coin then it should not have been clashed. I'll add here as well that there was a discussion on the old VAMworld forum about this when it was fresh. (although I've not been able to locate the thread) The pictures you loaded on CU actually lead me to believe you have a VAM57 with the beveled field under the tail feathers and olive branch. A BMP would surely not be struck from a pair of dies with that many miles on them.